Tai Chi is enjoyable, easy to learn and provides many health benefits. 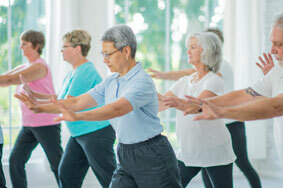 It is often described as “meditation in motion,” but it might well be called “medication in motion.” The program is a safe and effective system that enhances strength and flexibility, while reducing joint pain and stress. Qigong coordinates body posture and movement, breathing, and meditation used for health and relaxation. Date/Times: Thursdays, 10:15 a.m. – 11:15 a.m.
PAY AS YOU GO: Class fee payable at the time you take each class, by cash, check or credit card. No pre-registration or RSVP necessary. For your convenience, you can purchase multiple-class punch cards at the Front Desk in the Town Center.